A major component of answering those questions effectively is understanding in which social outposts your customers are concentrated. Because there really is no benefit in beating your customers to the punch. Companies should follow, not lead, their customers across the social Web. Flowtown and Rapleaf are two of the leaders in the emerging field of social anthropology. It’s ingenious, and a bit freaky (like Cirque de Soleil). You provide a list of your customers’ email addresses, and these services figure out how (and who) among your customers are on Twitter, Facebook, Linkedin and niche social networks, what their “likes” are, and other important details. 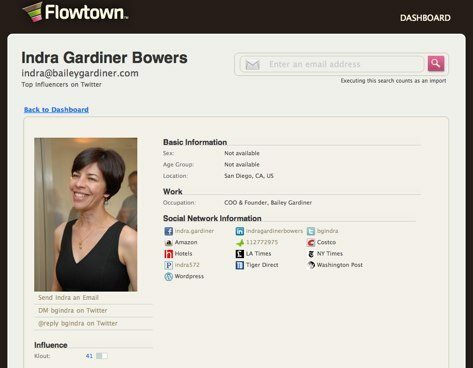 Flowtown is perfect for small and medium businesses (see my review here). Rapleaf is better for larger companies. My friend Kyle Lacy does a lot of consulting in this area, helping organizations with Rapleaf analyses. Perhaps the most obvious way of finding out where your customers are hanging out in social media is unfortunately the least utilized. Ask them. If you have a contact us form, an online lead generation form, an email newsletter sign-up, or a shopping cart, why are you still only asking for name, address, and email address? Add data collection fields for Twitter, Facebook, Linkedin (at a minimum). Have you added links to your social outposts in your emails? Have you added the ability for email recipients to share content on Twitter, Facebook, Digg and elsewhere? If you send email routinely, you need to integrate email and social immediately. Most quality email service providers give you the option of easily adding sharing tools, and you can then run a report showing which of your subscribers clicked your Twitter link, and/or shared content on Facebook. Presto! Now you know that person is active on those social outposts. Third, upload the .csv to your Gmail account. Now, go to Twitter and create a brand new account using your special new Gmail email address. 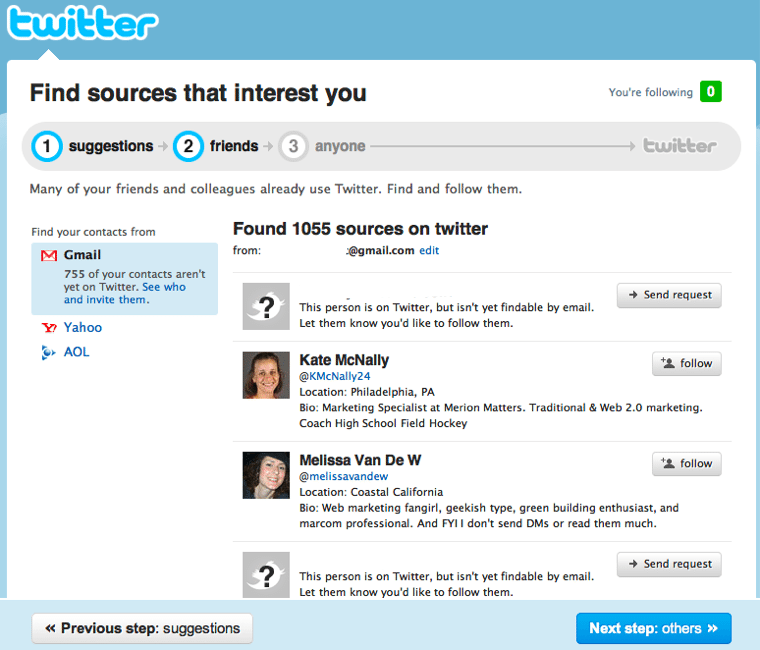 On Step Two “Find Your Friends” of the Twitter sign-up process, select Gmail. Bam! Twitter automatically reads all of the email addresses of your customers stored in Gmail, allowing you to track the number on Twitter and/or follow them immediately. Now, set up a new Facebook account using your new Gmail address. 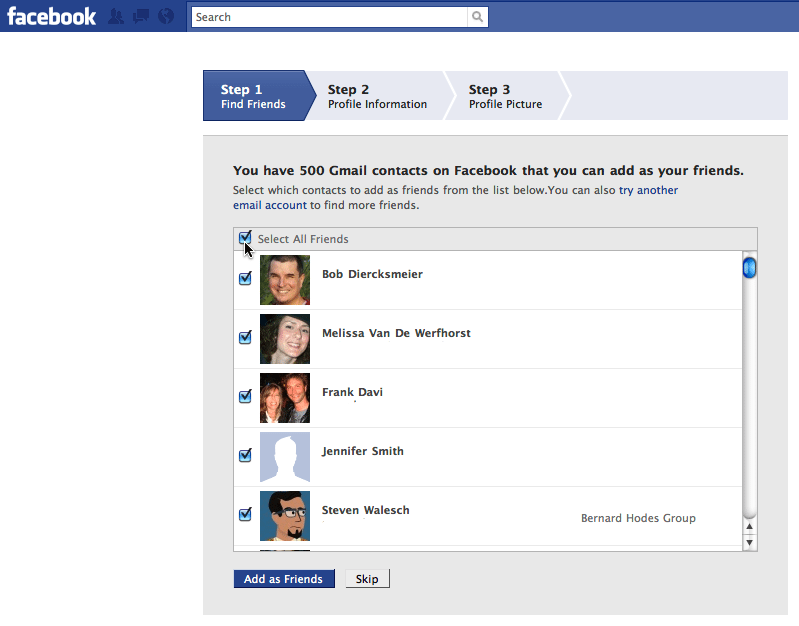 On Step One “Find Friends” of the Facebook sign-up process, indicate that you have a Gmail account, and follow the simple instructions. Bingo! All of your customers on Facebook are presented to you, and you should be able to become their “friends” with a single click. I uploaded a list of approximately 2,000 subscribers to my email newsletter (you’re a subscriber, right?) and was able to track down more than 1,000 on Twitter, and 500 on Facebook. Total cost? Zero dollars, and about 30 minutes. As the social Web becomes every more interconnected, understanding how your customers are connected (or connectable) to your brand in social media is a sizable part of the success equation. Are you a social media detective?